In the mood for soft chocolate chip cookies? I usually like them chewy, but last week I felt like changing things up a bit and made some soft chocolate chip cookies using sour cream. Of course knowing just how much sour cream to add is key. For instance I have a recipe for soft chocolate chip cookies that calls for 1 cup of sour cream and makes white, cakey cookies with a strong sour cream flavor, while others call for smaller amounts. 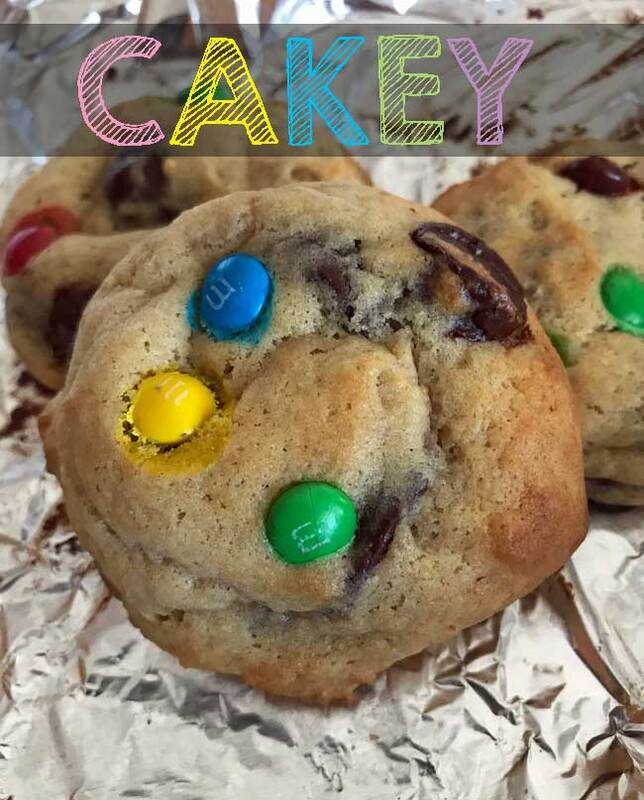 This recipe calls for 1/4 cup sour cream and gives you cookies that are cakey and soft with maybe a hint of sour cream flavor. The dough is soft, but it’s thick enough so that you can form and bake the cookie right away or chill the formed scoops and bake when convenient. 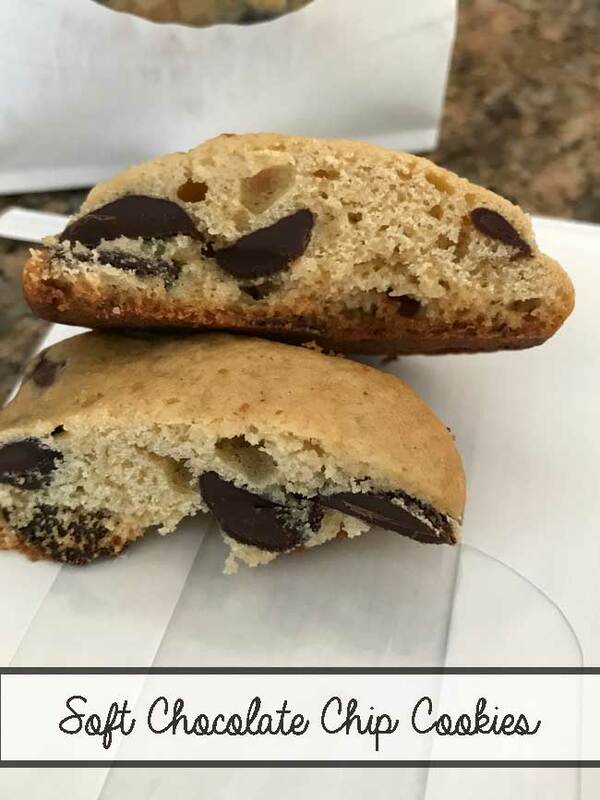 The cookie in the photo was made with dough that had been chilled for several hours. In addition to baking up soft and cakey, the cookies brown nicely which is good since sometimes sour cream enhanced cookies are on the pale side. They’re also slightly lower in fat than other chocolate chip cookies, which for me is an excuse to add more bittersweet chocolate chips! Throwing in a few M&Ms is optional. The only warning is that you probably shouldn’t make these with reduced fat sour cream. The cookies have slightly less fat to begin with and need all the fat in that 1/4 cup sour cream, so using something with a higher ratio of water might alter the texture. Now that I think about these might be even better with creme fraiche, so I’ll post an update if I try it. Soft Chocolate Chip Cookies are made with 1 stick of butter and 1/4 cup of sour cream. Mix together flour, salt, baking powder, baking soda and set aside. Beat butter and sugar with an electric mixer until creamy. Beat in the eggs, one by one, then stir in the sour cream and vanilla. Add flour mixture in 3 parts, stirring well after each addition. Stir in chocolate chips. Drop by tablespoons (or use a cookie scoop) onto parchment lined baking sheets. Bake cookies for 12-15 minutes or until just set and edges are lightly browned. Alternatively, you can scoop the cookie dough onto parchment lined plates, cover with plastic and chill overnight before baking as directed above. Let cool on baking sheets for about 5 minutes then transfer to a wire rack and let cool completely. There are always so many variables when it comes to baking, but I am curious to see whether the sugar is causing problems. Maybe the sugar/butter mixture needs less mixing since the sugar is already so fine. I hope Karen is able to find an answer to her flat cookie dilemma. I have a friend who is having the same issue with her tried and true recipes. She has also tried recipes I’ve given her that work great for me but not for her. These cookies look delicious Anna! Especially the ones with the M&M’s. I like the extra color. The sugar that dissolves quickly is usually labeled superfine, so I don’t know if your extra fine is as fine as that or is just somewhere in between superfine and granulated. If it’s as fine as superfine or finer than granulated then maybe the grind is having some effect on the air and leavening agents in the batter and the cookies are rising too quickly and deflating (as might happen if you were to overbeat). You should try the new sugar and if it works, then try the extra fine sugar but don’t beat with a mixer – just mix with a spoon and see what happens if you beat less air. The recipes I’m having trouble with are My “tried & true” recipes from the 1980’s. They use all “standard” ingredients. Some of them I have to use measuring cups to measure instead of weight, but that’s the way I always made them & they turned out fine. I live in Texas and am aware of humidity issues. But, I even have problems in the winter months. grain sugar? I bought a smaller regular grain bag of sugar to check this out. Unfortunately, it’s 109 Degrees here today (all week it’s been this hot), so I won’t be baking any time soon! Please let me know if you have any other thoughts on this. You must have some kind of cookie deflating poltergeist following you around. You could hire an exorcist or you could try using different sugar. Is the Sam’s sugar beet sugar or cane sugar? If it doesn’t say cane sugar then it’s probably beet sugar, and I’ve heard stories about people using beet sugar and finding their recipes don’t work quite the same. I’m just throwing that out there as something to experiment with, but it may or may not be the sugar. Have you changed brands of flour? Try using unbleached King Arthur or Gold Medal. Doubt it’s the flour, but it could be. It could be something with your leavening agents, but I get the feeling you’ve already experimented with that. Are you using thick, heavy duty rimmed baking sheets? It also could just be the recipe. Which recipes have been giving you problems lately? I’d be surprised if you made these cookies and they deflated. Feel free to email me if you want to troubleshoot some more because I always love a good cookie baking mystery. Anna, those cookies look so good!!! I really like how thick they came out. I would love to make them, but mine would be flat! I am an experienced baker of 40+ years and have NEVER had a problem with baking cookies until a few years ago. No matter what I do, my cookies deflate while cooling and are flat! I tried chilling the dough, decreasing the oven temp., increasing the oven temp., using 1/2 Butter & 1/2 Shortening, decreasing the amount of sugar, using freshly bought Baking powder and soda, etc. I even bought a new oven and tried Convection Setting and Regular Bake Setting.and NOTHING worked! Flat cookies every time!!! I weigh all my ingredients and my scale is accurate. The ONLY thing I can think that could be the culprit is I buy the 10 lb. Bag of Sugar at Sam’s Club and it is ” Fine” grain. Does the “Fine” Grain melt faster and make a difference in baking? PLEASE give me your expertise.